You may think that charging your phone consists of finding a cable with a plug that fits. Not so. Not all chargers are created equal. Some take much longer to fill your battery. Others are worse and can do lasting damage to your device. That fake charger cable may be killing the battery it was supposed to revive! Fortunately, chargers aren’t hard to understand, and a few basic steps can keep you out of trouble. Mobile phone chargers have a basic job. They supply your device with power. This activates the charging circuitry, which goes about the process of rejuvenating your depleted battery. For this reason, phone chargers are more aptly called adapters. Their job isn’t to charge your device. It’s to convert DC power to a level your phone or tablet can handle. Power adapters may seem like simple cords that transfer current to your phone, but the process isn’t so straightforward How a Battery Works and 3 Ways You Can Ruin It How a Battery Works and 3 Ways You Can Ruin It The modern battery is featured in so many of our favourite technologies that you could almost be forgiven for not spending time learning about their workings. Read More . There are various parts inside that bulbous plug. A regulator, for example, tells the charger when your phone is full. This way it doesn’t continue trying to provide power (though it will still draw electricity from your socket, even if you disconnect the phone). Constantly overcharging a battery will shorten its lifespan. Such components protect your handset from power spikes and the opposite: drawing too little power. Some chargers will make your phone think it’s charging, but an hour later, you check your device to find that all the adapter did was keep the lights on. Your battery isn’t the only thing at risk. Googler Benson Leung has made it his mission to review USB Type-C accessories The Best USB-C Chargers: What's Safe and What's Dangerous? The Best USB-C Chargers: What's Safe and What's Dangerous? What are the best USB-C chargers? Benson Leung and Nathan-K's roundup of the best chargers on today's market can be complex to read. Fortunately, we've simplified it for you! Read More to make sure they are quality products. In the process, he lost a $1,500 Chromebook Pixel to a bad cable. Trying to save money on a cheap USB cable can ultimately cost you a great deal more money in the end. Apple’s chargers are exorbitantly expensive, but the Chartered Trading Standards Institute conducted an investigation where 397 of the 400 chargers it purchased online failed a basic safety tesk Why You Should Never Buy Fake Apple Chargers Why You Should Never Buy Fake Apple Chargers No one likes paying full price for things. Unfortunately, when it comes to Apple chargers there really is no alternative to buying the real thing. Read More . Some cheap chargers might not meet certain regulatory standards. They may contain harmful materials that pose a threat to you or the environment. 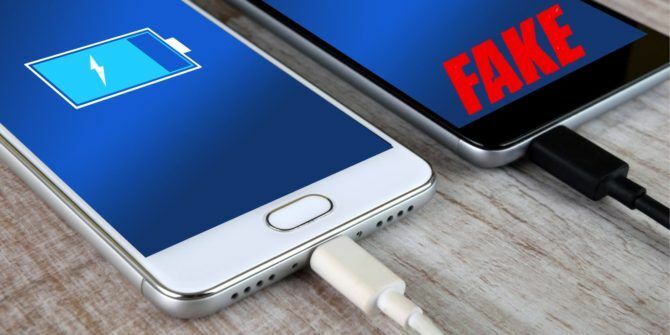 Fake chargers may even be physically defective, with prongs that come out when you try to unplug them from the wall. On the positive side, you’re not likely to find fake chargers at brick and mortar stores. That said, you can find no shortage of cheap microUSB cables stocked up on store shelves. Here are some tips to give your battery a long, happy life. You may have several dozen microUSB chargers lying around, but it’s worth using the one that came with your phone or tablet. Carry it around with you in your bag so that you can use the same power adapter when away from home. This is the single easiest thing you can do without having to learn a thing about how chargers work, as long as you keep the cable in good condition 5 Quick Tips for Taking Good Care of Device Chargers 5 Quick Tips for Taking Good Care of Device Chargers We fret so much about taking care of our batteries that we often forget to take care of our chargers! Here are a few tips you should keep in mind. Read More . But there are times when you need to charge your device in the car. What then? Many manufacturers do not offer an official car charger. You are going to have to venture out and buy one from someone else. The next steps will give you a few things to keep an eye on. The power adapter that comes with your phone supplies what the manufacturer has determined is the ideal amount of power. If you’re looking for a second charger, first make sure that the input/output levels match the one that came with your device. Look at your adapter. An input level of 100–240 V shows the acceptable amount of voltage. Plugging it to an outlet or source above this range can destroy the charger. Then look for output levels. If your battery needs 4.2 volts to fully charge, then you need a power adapter that can reach this level. One that outputs around 3 V will not be able to charge a 4.2 V battery, which is why your decade-old charger may not work with your latest phone. Next, check amperage. Many smartphone chargers provide an output of 1 A. A device that requires less than 1 A will only pull what it needs. But if your adapter only provides 500 mA, a device that needs more may, at best, charge slower, and at worst, get damaged. Some devices won’t accept a charger that doesn’t supply enough power. Many tablets come with 2 A power adapters. Some certifications, such as CE, show a manufacturer’s commitment to meeting the regulatory standards of a given area (in this case, the European Economic Area). RoHS certification shows that a product does not have certain hazardous materials. 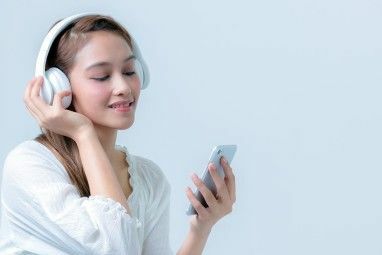 These offer assurances that a product will not only be less likely to damage your device, but you, your home, and the rest of the environment The Truth About e-Waste Recycling and Its Effectiveness The Truth About e-Waste Recycling and Its Effectiveness The world is producing more e-waste than ever before. We should be recycling it, but there are some problems there that you may not be aware of. Read More . If you have an iPhone, look for the Made for iPod logo. This is Apple’s licensing program for companies that develop peripherals for its products. Despite the name, it applies to the iPhone and iPad as well. Do a comparison with the charger that came with your device. Some fakes can be very convincing, showing the same brand name and a few certifications but not all the ones that the real one offers. The visual difference may even come down to a few words. Compare the weight of the two chargers. Tap on them to see how they sound. These steps aren’t necessary if you’re comparing the official charger to a third-party option, but it’s essential if you think you may have purchased a fake. Are You Concerned About Your Charger? Smartphones aren’t known for having the longest battery life Which Smartphones Have the Best Battery Life in 2016? Which Smartphones Have the Best Battery Life in 2016? Mobile phone users today demand battery life over all other concerns. Short battery life is the only real limitation of the modern smartphone. So which smartphones offer the best battery life? Read More . Still, if your device drains quickly and charges slowly, double-check your chargers. One of them may not be doing you any favors. I know I’ve long used whichever microUSB cable I can find to charge my devices. What about you? Do you stick to the cable your device came with? Are you happy to borrow a friend’s? Have you typically gone for expensive chargers or the cheapest ones you could find? Notice any impact on your phone? Share your story with us! 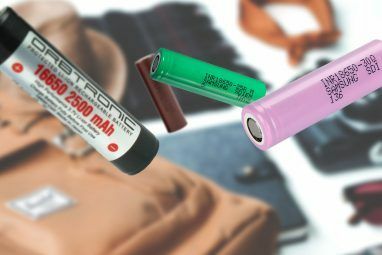 Explore more about: Batteries, Battery Life. Does this article apply to Android devices? Yes. The first video shows fake Samsung Galaxy Android phone chargers in particular. If I have other chargers that are charging my device, may I assume they are doing no harm to it? Not necessarily. My advice is written in the post. Check input/output levels to make sure the numbers match what your phone is intended to handle. Check certifications. Lithium-ion batteries get worse over time on their own, but a bad charger can speed up the process. Chargers that charge slower will not damage the battery. (It is actually better for the battery to charge slower). The key here is to have the charger able to sense the end of charge condition (usually within the phone or device) and then stop charging. Using a standard USB port only allows 500ma of current per the standard. Chargers using a USB port can supply more current, but only if the device properly handshakes, or a connection within the cable or device tells the charger to deliver more than 500ma of current. Good to know. Thanks for providing this feedback!